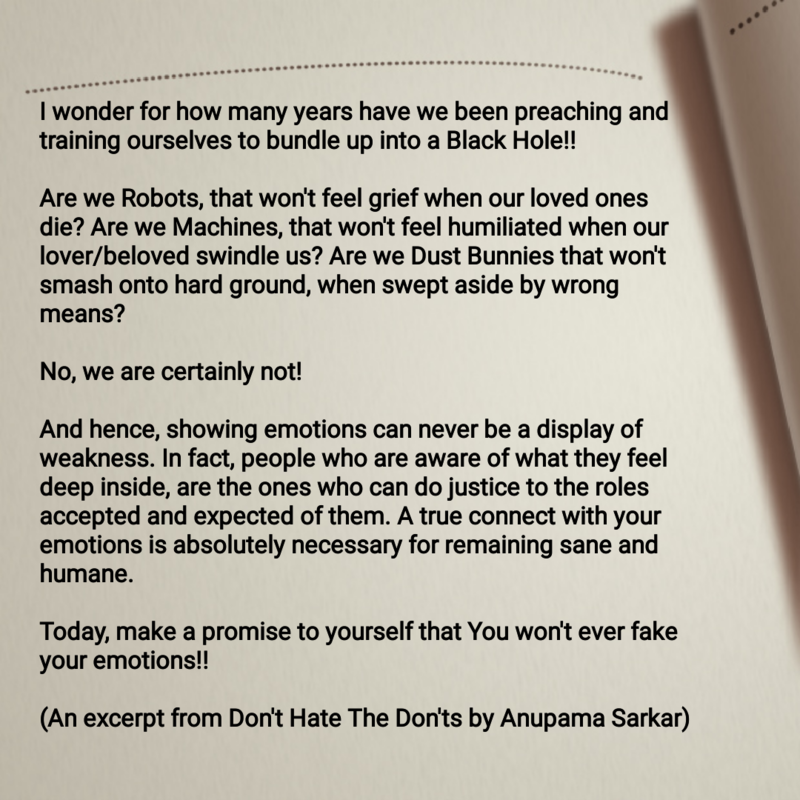 Don’t Hate The Don’ts is my first book, published recently on Kindle. I had been thinking of publishing an eBook for a long long time. In fact, one of my Hindi book was all rolled up to make it’s way through the publishing gates. However, something or other kept delaying it. I felt weird that why am I not going ahead with my plans, is there something else I should do first? But, what? Nothing came up, no inner voice, and certainly no answers from the Heavens either! And then as 2018 marched off, and 2019 proudly entered the scene, in the early hours of First January, I felt an irresistible rush to write! I found some ideas are literally jumping up and down in my mind, squirming to be released, to be put on paper, to be out in the World. And, in a jiffy, I realized that my debut book cannot be a Hindi one! I began my writing career as a Motivational Article Writer, and it’s but preordained that I must dedicate my first book to the philosophical thoughts and random nuggets of wisdom, I keep penning down effortlessly. I felt my Consciene calling me out! And, without any delay, I grabbed my phone and began to type. Hours flew by as I kept writing. I found that my typing speed was way too slow to keep up with the continuous stream of words and ideas, pouring out of my Soul. And yet all this rush felt so therapeutic. Words and phrases jostled with each other as I bombarded my poor touchphone, all through the First Jan.
First Sunshine of the Year, opened up a new vista for me. I worked like a possessed soul and in a week, was ready to present my first book to the World! Writing Don’t Hate The Don’ts contented me, soothing my nerves in a never beore fashion. As I read and reread what I had written, the belief that this is what I had been wishing to do, for a long long time, kept getting stronger. I enjoyed creating the book from a scratch. It transformed from a haphazard phrase “Don’t do this” to a mount of more than seven thousand Words magically. Writer’s satisfaction was writ large on my face. And then came the hard part, my book was to be launched as an eBook. And I didn’t know anything about publishing online. My idea of books has so far been, handing over the manuscript to someone trustworthy. And let their good skills take over. But, publishing online was an altogether different game! Thankfully, my brother stepped in! He has already published two eBooks on Kindle and looked like a Pro in comparison to the Naive Me. A little bit of cajoling and Yogesh Sarkar agreed to help. And as he stepped on the scene, I realized how essential a good editor is! To my utter surprise though, Reading Re-reading and Editing was taking much more time than writing the first copy. Meanwhile I fidgeted, twitched, got angry and subdued by turns. However, the waiting was worth all the effort as the two of us finally agreed on all the points. Yogesh came up with good suggestions, the book benefitted a lot from his careful reading and critique and finally it got ready for the last step. Publishing was the final step. Kindle Creator proved to be a life savior. The upload was hassle free and cover creation super smooth. And before the first month of the year folded up, my first book was released online! Don’t Hate The Don’ts is very special for me, not only because it marks my debut as an author, but also because the preparation and final presentation, made me see a few flaws in myself, getting impatient and irritated being the most prominent. It’s always good to see and accept yourself the way you are, that way you can easily mend yourself. As I wrote, read and publish Don’t Hate The Don’ts, my belief and faith in myself grew even stronger. The eBook is available for Free on Kindle Unlimited and can be ordered for just Rs. 99/- on Amazon. If you are interested in reviewing the book, you can also contact me here. All your views and comments are welcome.